The farm shop is a busy place this time of year getting equipment ready for spring work. As you are doing maintenance and repairs on equipment to prevent any delays, remember to do some daily basic housekeeping in the shop. · Keep walkways and areas in front of workbenches free of clutter. Mark walkways on the floor to prevent trip or fall hazards. Keep work mats flat on the floor. · When working at the workbench for an extended time, use a stool to rest on and take some of the strain off your lower joints instead of standing all the time. Use a short stool when working on equipment instead of sitting on a cold floor or kneeling on it. · Put tools away when done with them so you are not stepping on them and they can easily be found when needing them again. · Use a rolling toolbox if possible and keep the tools you are going to need close buy. · Keep new and used parts out of walkways and keep them in their designated storage areas when done. · Try to eliminate as many trip hazards as you can. · Do not let packaging materials, boxes, pallets or other trash build up in working areas. Dispose of it properly. · Be sure that containers and materials stored on shelves are stable and secure and also that the shelving is designed to handle the weight. Keep frequently used items on shelves in an area 18”-54” off the floor for easy access. · Organize chemical storage areas and keep them secure from loss and access by any unauthorized persons. Keep pesticides, herbicides, and flammables separated to prevent unneeded issues. · Keep welding and cutting areas free of debris to prevent fire hazards. 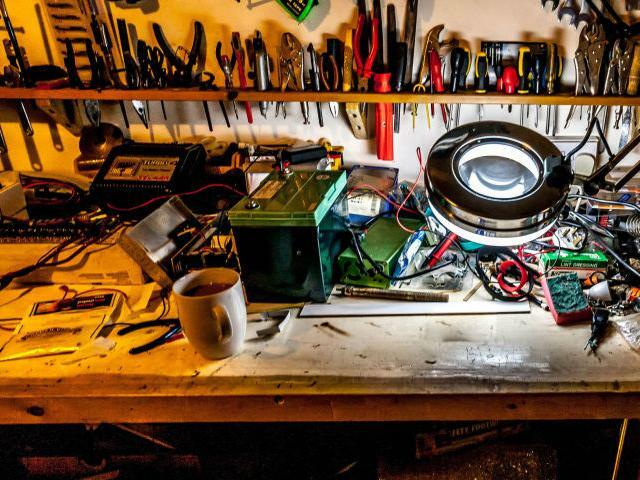 · Spend 10 to 15 minutes at the end of the day in the shop cleaning up and organizing the work area. · Outside the shop, keep walkways clear of snow, ice and other clutter to prevent falls. Following these safety tips will keep you organized and ready for a busy planting season.